Event will be held at Cibola High School! 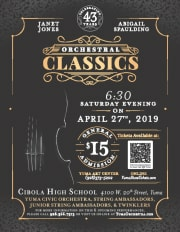 Join the Yuma Civic Orchestra, the String Ambassadors and Twinklers for its final concert of the season. Our musicians are looking forward to bringing Yumans an orchestral classics concert where our community can experience the power and imagery that the music brings. Some of the pieces selected for this concert include Andalucia by Ernesto Lecuona, Jupiter by Gustov Holst and March Slav by Pyotr Tchaikovski. This concert is dedicated specifically to those in our community and surrounding areas who love classical music and who support us all year round. Refunds & Exchanges: No refunds or exchanges are allowed. Seating: If, in the rare occurrence, a seating issue occurs an alternate seat will be provided with proof of purchase. Performances and events are subject to change without notice. Disclaimer: This website is operated by TICKETsage, Inc. The City of Yuma does not promise that the site will be error-free and uninterrupted. The City of Yuma cannot ensure that files you download from the site will be free of viruses, contamination or destructive features. The City of Yuma will not be liable for any damages arising from the use of this site. Contact us: You may contact the Parks & Recreation Department inside City Hall by phone (928) 373-5243, the Yuma Art Center by phone (928) 373-5202, or the Yuma Civic Center by phone (928) 373-5040 or E-mail Us. © City of Yuma · Powered by TICKETsage.